Inflammation, which is the root cause of autoimmune disorders including arthritis, Type 1 diabetes, irritable bowel syndrome and Crohn’s disease, has unexpected effects on body clock function and can lead to sleep and shiftwork-type disorders, according to a new study published in the journal Genes & Development. The study used a new technology — a genetic switch — to turn inflammation on and off in genetically modified mouse models. When scientists deactivated inflammation, the mouse was unable to tell what time it was and was unable to keep an intact rest-activity cycle. In addition to this new technology, the study was novel because, for the first time, scientists saw a genetic link between what causes inflammation and what controls the body’s clock. In inflammatory diseases, the body experiences an excess of a genetic factor known as NF-kappa beta (NFKB), the study found. NFKB is a catalyst for a set of chain reactions, or pathway, that leads to the pain and tissue destruction patients feel in inflammatory diseases. That same chain-reaction catalyst also controls the body’s clock. “NFKB alters the core processor through which we tell time, and now we know that it is also critical in linking inflammation to rest-activity patterns,” said senior author Joseph Bass, MD, PhD, the Charles F. Kettering Professor of Medicine in the Division of Endocrinology and director of the Center for Diabetes and Metabolism. 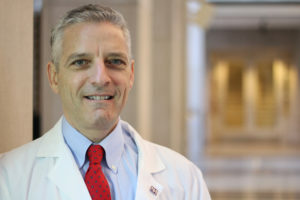 Joseph Bass, MD, PhD, the Charles F. Kettering Professor of Medicine in the Division of Endocrinology and director of the Center for Diabetes and Metabolism was the senior author of the study that found inflammation has unexpected effects on body clock function. The findings also have implications for diet and provide a detailed roadmap to understanding the fundamental mechanisms by which inflammation — including the inflammation that occurs when someone chronically consumes a high-fat diet — and likely other instigators lead to circadian disorders. “We don’t know the reasons, but this interaction between the inflammation and clocks is not only relevant to understanding how inflammation affects the brain and sleep-wake cycle but also how immune or fat cells work,” Hong said. The study is titled, “Requirement for NF-kB in Maintenance of Molecular and Behavioral Circadian Rhythms in Mice.” Other Northwestern co-authors include Grant Barish, MD, assistant professor of Medicine in the Division of Endocrinology, Kathryn Ramsey, PhD, research assistant professor of Medicine in the Division of Endocrinology, Eleonore Maury, Mark Perelis, Biliana Marcheva, Chiaki Omura and Yumiko Kobayashi. This research was supported by National Institute of Diabetes and Digestive and Kidney Diseases grants R01DK090625 R01DK100814 and R01DK108987; National Institute on Aging grant P01AG011412; Chicago Biomedical Consortium S-007; National Institute of Child Health and Human Development grant R01 HD089552; American Diabetes Association grant 1-17-IBS-137; and a grant from the Association de Langue Francaise pour l’Etude du Diabete et des Maladies Metaboliques.